By Valerie Streeter, Tulalip Tirbes Natural Resources Dept. 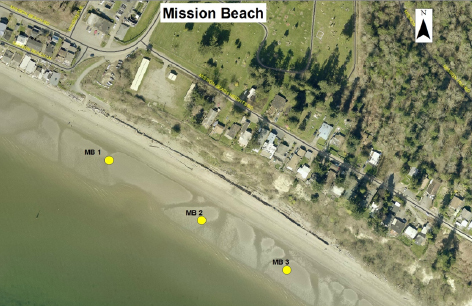 For the past three years, WSU Beach Watchers volunteers have monitored the quality of water at Mission Beach each week during the summer months. Every Tuesday, you will see them dipping bottles into the water or monitoring the temperature and salinity. The volunteers drive the water samples up to the Tulalip Water Quality Lab, where Harvey Eastman analyzes the water samples for bacteria levels. The beach has been sampled nine (9) times this summer. So far, this year has the lowest bacteria levels in the water when compared to 2016 and 2017. These levels are well below the threshold limit for swimming, which means that the water is clean! The graphs below show the average result from the three beach sampling stations for this year as well as the last two years. The green line shows the bacteria threshold limit (103 mpn/100mL) and the other line is the average amount of bacteria in the water at Mission Beach (not above 7 mpn/100mL for 2018). If bacterial levels are above the threshold limit, there are more chances for skin infections or gastrointestinal illness from too much pollution. Water Samples are collected from three locations on Mission Beach and the bacteria results are averaged. This entry was posted in Environment, Tulalip News by Kim Kalliber. Bookmark the permalink.